The largest part of our collection are the items produced for the United States Military. A huge draw to ration collecting is the opportunity to try entire meals from all over the world. The Cold War made preparedness and ration storage commonplace in American homes. Wondering what rations are like? Watch one of the many reviews from our favorite presenters. 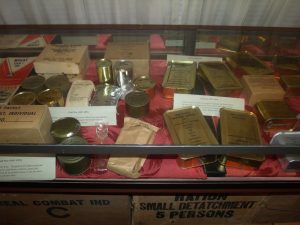 First Ever Military Ration Symposium! Ration collectors! Ration enthusiasts! Friends of history! We need your help to get up and running. Right now, our biggest concern is where we're going to call home. We're reaching out, trying to find a suitable property in Bozeman, Montana to turn into the Ration Museum. That's our main goal. Beyond that we have to cover our budget for things like appropriate memberships and partnerships, and for day to day needs like the necessary insurance for the board and for the collection, a phone, post office box, accountant, software, etc. Once we have a property, we'll be holding our primary fundraiser to cover the creation of our initial exhibits. We want you to be a part of it. Please head over to the donation page when you can and chip in - we very much appreciate it!